A long time ago, the Accidental Locavore learned that the easiest and most impressive thing you can cook is a roast. It really takes no effort and with an instant-read thermometer is essentially fool-proof. More recently, I’ve been cooking rack of lamb, which is easy and unlike bigger roasts, quick. This is a Mexican version from Rick Bayless that’s grilled and I’ve adapted to serve 2. It would be quick, but you need to figure in marinating time. Heat a small sauté pan over moderate heat. Add the garlic and toast until the skin is blacked, about 10 minutes. When the garlic is done, add the chiles and toast them, pressing with a spatula about a minute on each side. Transfer the chiles to a small heat-proof bowl, cover with water and microwave about 1 minute until the chiles are soft and re-hydrated. Peel the garlic and set aside. Transfer the chiles to a blender or food processor, with 1/4 cup of the soaking liquid, garlic, honey, vinegar, oregano, cumin, salt and pepper. Puree, then strain. Rub the lamb with 1/3 of the puree. Put in a Ziploc bag and marinate for at least 2 hours or overnight in the refrigerator. Cover the remaining puree and refrigerate. Light the grill. Grill the lamb over medium-high heat, turning it until lightly charred outside and the instant-read thermometer registers 135° for medium-rare. Lower the heat if the lamb starts to burn. Should be about 10 minutes per side. Transfer the lamb to a carving board and let rest for 5 minutes. While the lamb is resting, simmer the remaining puree with 1/8 cup water in a small saucepan over medium heat. 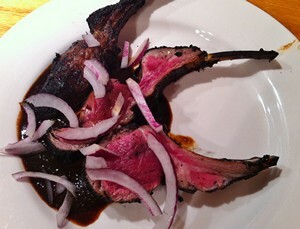 Carve the lamb into chops, top with the sauce, and garnish with red onion. Serve and enjoy! My verdict: Good, but here’s how I would tweak it. Pasilla chiles aren’t terribly spicy so if you’re looking for heat, adding a chipotle in adobo to the marinade might be a good idea. Next time, I might grill a lime and add that and some cilantro to red onion as a garnish. The original recipe calls for topping the lamb with queso anejo, but I was too lazy to go to the Mexican grocery. I’m not sure if that would have been the needed kick, but since most Mexican cheeses are pretty bland, I don’t think so. your grilling ideas are always exciting, but the actual mention of 8 bones for two people has me over the moon! Next post: Why is Everything on Pinterest so Beige?